PressWise offers a whole array of features in a single integrated web-based system that will cover every aspect of your business. We also offer a self-hosted version for those customers that prefer to host the system on their own servers. Download the PressWise Brochure for more detailed information on each module within the PressWise system. PressWise offers a complete web-based product that enables Print Service Providers (PSP) to capture more business, lower service costs, and retain accounts in a competitive environment without the high cost of custom development. No other storefront product creates customer stores like PressWise does... storefronts are built automatically and your customers can be shopping online, or quoting their own jobs, in less an hour! 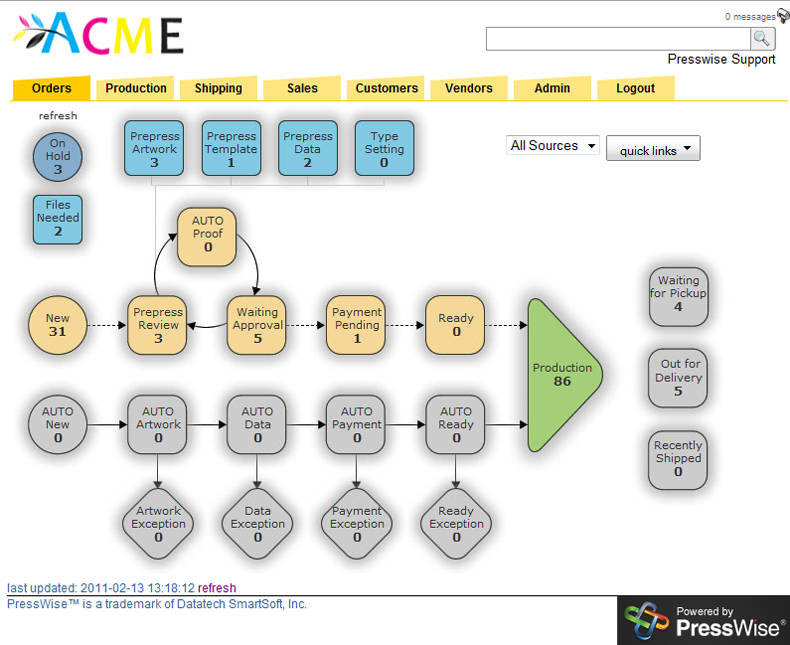 The PressWise comprehensive web shopping system is fully integrated with an MIS suite. Web2Ship means you won’t have to rekey data to get it to production, or to ship and bill it. Designed to help you grow your print business, PressWise lets you create unlimited customer accounts, each with a built-in website and catalog used to store documents. There is no limit to the number of templates, products, catalogs, accounts, or orders you can create. Increase your efficiency by streamlining the process of estimating and quoting your digital jobs. 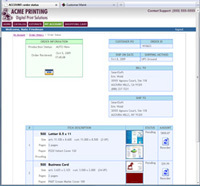 From business cards to complex projects, CSRs or Sales Reps can quickly produce professional looking quotes that are easily emailed, printed and saved for later retrieval. Custom pricing is supported for each client, as well as individual products. Paper and other cost centers are easily defined so that unique one-of-a-kind jobs can be quoted for any quantity point. 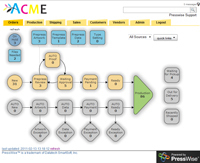 Customers can use the online estimator and build their own jobs. Thousands of custom jobs have been successfully created by print buyers who created estimates, uploaded artwork and placed orders around the clock. Our proprietary order processing and management system makes it easy to control any level of business, with a design that is natural, intuitive and versatile. Eligible orders flow from the shopping cart, through automated flight-checking, to production, with no human intervention. Custom orders that need inspection are automatically staged for Customer Service Reps and pre-press staff to take action. The tools workers need are just a click away: credit card processing, email messaging, estimating, digital asset management, proofing controls, QuickEdit to fix typos in artwork, and much more. 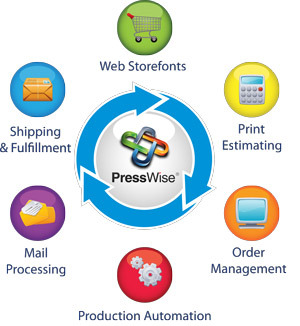 PressWise has been used to fulfill millions of orders in over 90 countries. PressWise Production will help you manage your shop more efficiently, whether you’re just starting to build your business, or needing to push production with multiple shifts. Production managers will love the top-down view of orders according to job status, as well as the ability to view detailed production data for any day and time. Production staff will appreciate the control it gives them, your customers will appreciate the effect this has on customer service, and you’ll appreciate the positive effect it has on your ROI. 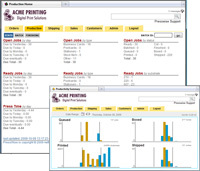 For high volume producers, customizations are available including statistical processes that will automatically release jobs to press queues and respond to changing demand levels, as well as automatic insertion of marketing promotional pieces. Capture incremental revenue previously lost and provide customers faster turnaround with a single source for their digital marketing needs. 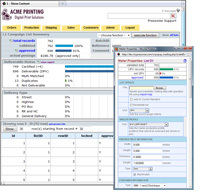 Our optional separate Mailing Module offers CASS™, DPV®, NCOALink® and PAVE™ Certified Presort processing, meaning your team can easily prepare mailings for any digital press. Ready-to-mail postcards, newsletters and flyers flow from your digital press as easily as standard jobs. 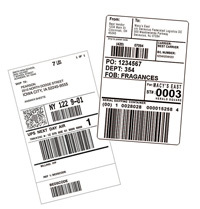 Postal paperwork and required tray labels are prepared for easy drop off at your local post office bulk mail counter. Plus, if you’re currently using a third-party mailing application, we make it easy to switch so you gain from the extra efficiencies that our built-in mailing solution provides. Overhaul your shipping and fulfillment area with PressWise. We offer integrated UPS® and FedEx® shipping services, with support for third-party billing and blind-shipping. 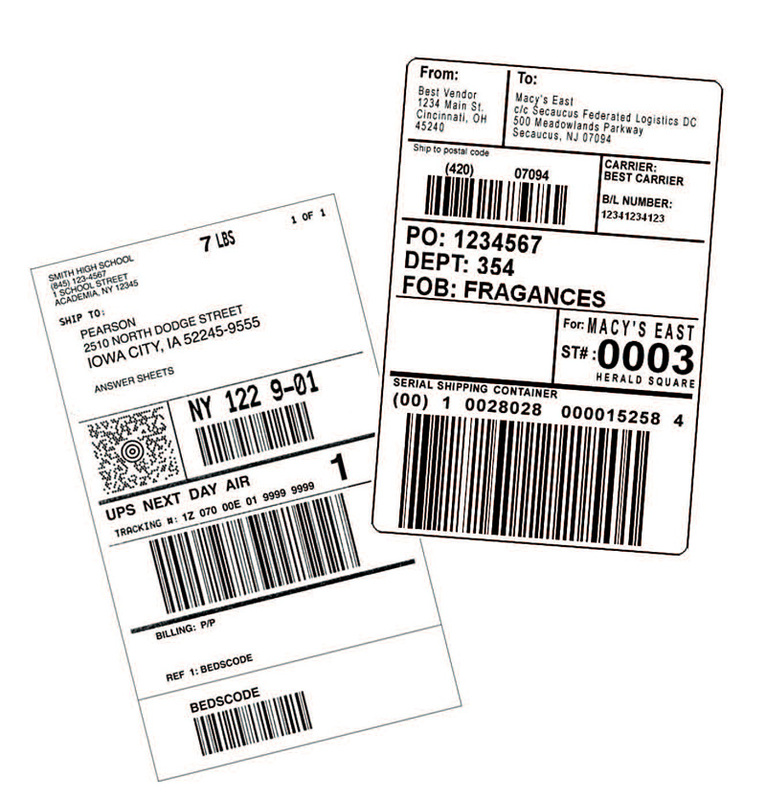 On-demand shipping labels are printed seamlessly, as workers barcode scan each package to be shipped. Intuitive software design prevents incomplete orders from accidentally shipping. To improve client communication and speed the billing cycle, email notifications, which include package tracking links and an attached PDF invoice, are sent to clients as each shipment is completed. Performance improves dramatically for typical small to medium sized printers where manual processes are now used. Expect a single worker to accurately process over 100 shipments per hour! 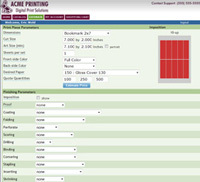 For more information on these great features, including more screenshots, take a look at www.PressWise.com. To schedule a personal web demo of the product, please contact us and we'll schedule a time convenient for you.